A lot of times when I sit down to write these reflections, I honestly have no idea what to say or write. I will ask someone for a topic if they stop by my office, look at the lectionary for that day, I have even phoned a friend. More often than not, I use my own life and questions I have at the time and use those as a springboard into a larger topic. This week I wanted to speak on something that may be difficult for all of us to do because it involves those not so great times in our lives. I think it is pretty safe to assume that we all have had these times; times when we are separated from God. Whether it is by our own choosing or our reaction to those situations placed before us. In C.S. Lewis’ The Great Divorce, he describes heaven and hell as these sort of city like places. Where as you become closer to God, you move closer to the center of the city of Heaven; and as you move further away from God, you keep moving beyond the outskirts of the city of hell. I am talking about those times when we have gone past the last house on the block and settled in on the outskirts of hell. While I was thinking about this concept, a certain verse stuck out to me. I remembered thinking it was rather peculiar even when I heard it read in church over a year ago. 2 Samuel 11:1-15. This is the story of King David and Bathsheba. I invite all of you to take the time and read the passage as it but if you are unable to right now, here is a quick recap. David sees Bathsheba bathing from afar. He calls for her to come to his home. She becomes pregnant with his child. Both David and Bathsheba were married to other people already. David tries to have Bathsheba’s husband return from war to spend the night at home. Uriah refuses. David sets up for Uriah to die in battle. Wow. You can’t make this stuff up! I remember sitting there thinking, what message could this possibly have!? When you have questions like this regarding something you hear during a church service it is normally a good thing to read the Collect for that day. In this story from 2 Samuel, King David, God’s chosen leader of the Israelites has become lost and confused. He has turned his back on God. According to Lewis, he is living in his own personal hell. I think this is a place most of us have experienced. It is never a fun or pleasant thing to reflect on these times or the circumstances as to which we are there, but I think it is something we can all relate too. Now, shifting gears for just a moment. Have you seen Michelangelo’s painting of the Creation of Adam? There we go. I only want to focus on the hands for this part. Did you know Michelangelo got into A LOT of trouble for this painting? Can you see why? 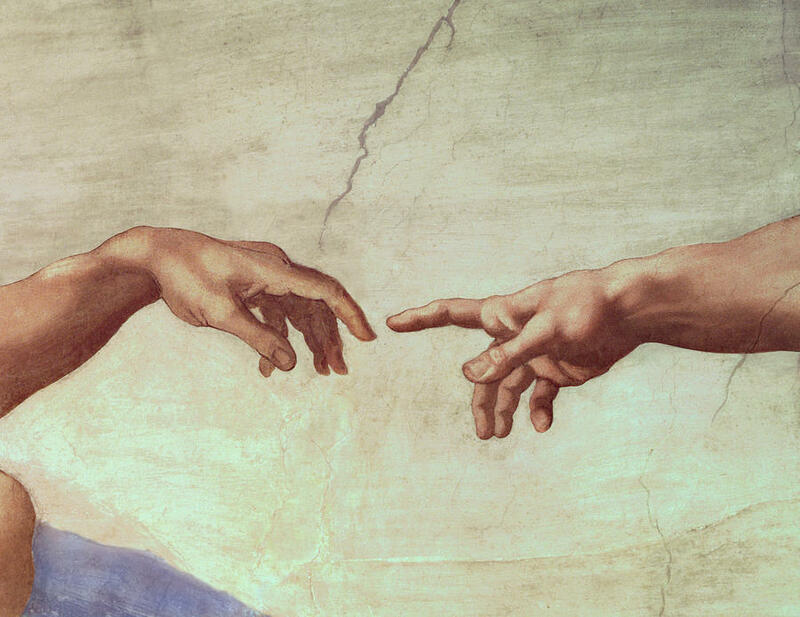 In the painting, God is reaching, almost straining to reach Adam. Meanwhile, Adam just kind of nonchalantly holds his hand out. At the time, not too many people in the Vatican were pleased with this visual. Now, back to David and 2 Samuel. Sometimes, we all may wander and turn our back to God. I can say it has happened to me personally and just about everybody I know! It is part of being human! It is during these times that we experience one of the greatest gifts of God! While we may turn our backs and nonchalantly hold our hands out, maybe we don’t even have our hands out at all. During those times, God never stops reaching. God never turns a back us. For it is during these times that we are blessed to receive this great gift of God’s grace! Sometimes it is not an easy gift to receive. It requires that we humble ourselves. Yet, it is a gift that has already been given to us. It is a gift that is being given to us. It is a gift that will be given to us. How will you accept it?